If high humidity results in health hazards, so does the low humidity. To increase humidity, air humidifiers are used. Humidity can be low in deserts, or places with high temperature. 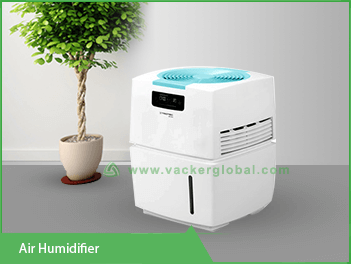 There are different types of air humidifiers to be used in room, entire home, offices, medical ventilators, factories and so on. 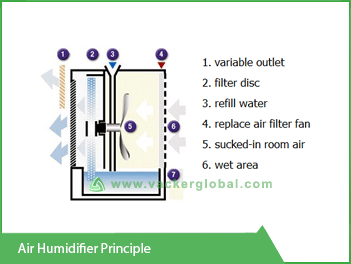 Why to use a Humidifier in a home or office? For a human living environment, ideal humidity should be above 45%. In winter season, humidity will be low. Also if you are using a heater in winter, humidity will be low. In winter outside air is colder than inside. Hence humidity tends to be lower inside the rooms. This can cause cracked mucous membranes in nose and throat. This results into throat infection, respiratory problems, skin rashes etc. In order to avoid such cases, you have to use an air humidifier. Also, dry atmosphere causes damage to artefacts & frames of musical instruments. They develop cracks due to dry conditions. Another issue of low humidity is that static electricity which can even increase risk of fire. If static electricity is built up, a small friction can generate a spark. In order to reduce this risk, humidity has to be increased. Cold storage used to store almond, nuts etc. Cold rooms used for storage of fruits. Various fruits need to be stored at specific temperature & humidity levels. Storage of tobacco. Tobacco has to be stored at high humidity levels. Home and offices in countries with dry climatic conditions. Storage of Potatoes, apples, mushroom etc. To increase humidity in health centres and Yoga centres. Storage of dates, fried chips etc. Air Humidifiers can a serve great many purposes. Industrial models are installed in factories, warehouses and other large spaces. For human beings the ideal level of humidity is between 45 to 65% RH. If the level is lower than 45%, it will be very uncomfortable. Other than industrial models, there are portable humidifiers for focused spaces. These include particular room in a house or office, furnace or whole-house humidifiers. These can also be connected to the HVAC system to humidify the entire house. Portable evaporative air humidifier where humidification is done with some wicks, a reservoir full of water and a fan. Vaporizers, cool mist humidifiers where a rotating disc is used to break water into fine droplets and release in air. Ultrasonic humidifiers are small models for household applications. 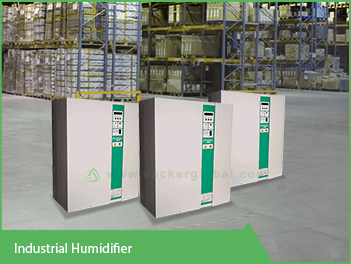 Steam humidifiers generate high humidity by producing steam. These are mainly for industrial applications. Maintaining a definite level of humidity is very important for the well-being of human being and enhanced lifespan of equipment. This is why humidifier is a compulsory machine in offices of dry and hot regions. Some of the added advantages of humidification are relief from sinusitis, quick healing, no snoring, no bleeding from nose, and glowing skin. So, before dry air in your home or office takes a toll on you, your family members’ or employees’ health, get one right away. 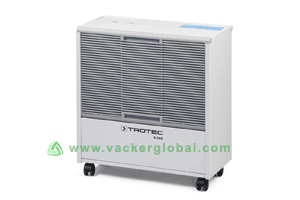 This model is for home and small offices and works on principle of evaporation. Evaporation of water increases humidity. There is a small water container in the machine. There is a fan, which evaporates water into moisture. This moisture spreads in the room to increase humidity. 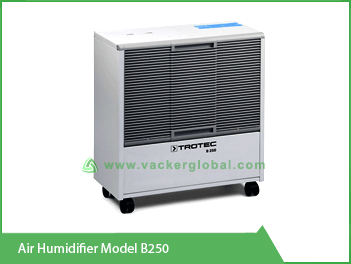 Major features of this air humidifier are explained below. Maximum air flow rate is	500 m³ per hour. Electrical Input voltage 230 Volt AC, 50 Hz. Power consumption is 0.050 kW. It has a evaporation capacity of 28.8 liters per hour at at 23 °C & 45 % RH. The machine is suitable for a room size of 450 m³.